Vacation rental house. Sleeps 6, 3 bedrooms, 1 bathroom. Cats, Dogs allowed. 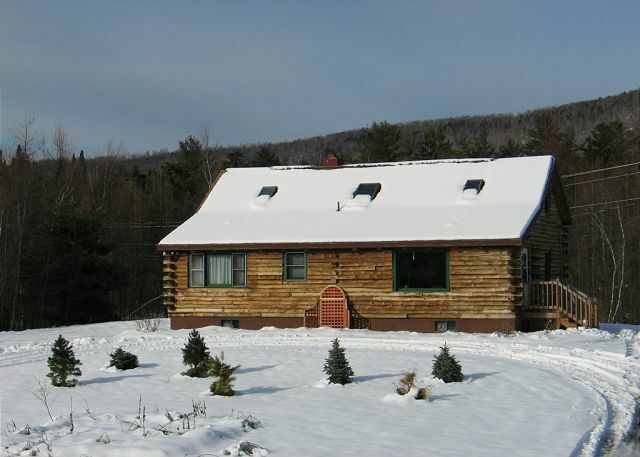 Located in the heart of NH's White Mountains, this Twin Mountain log home is an outdoors enthusiasts and family get-away vacation rental not to be missed. Seen here draped in summer's blues and greens, the Twin View Log Home is a stones throw away from some of NH's best stream fishing and all of the best White Mountain Attractions. 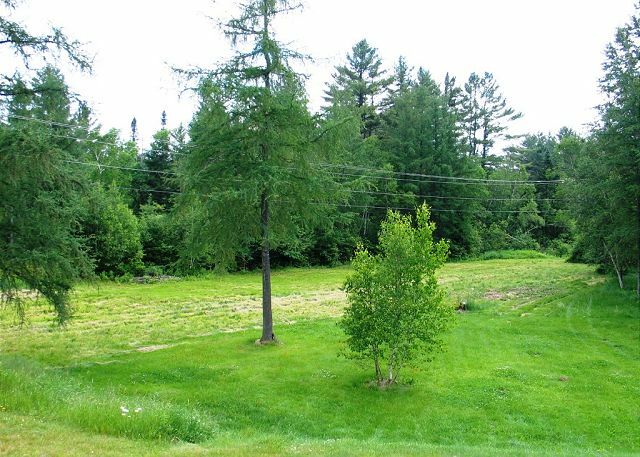 The Twin View Log Home offers guests lots of property to rest and relax, and there's tons of mowed outdoor space for the kids to go out and play. Marshmallows and s'mores made fireside are sure to be a hit! 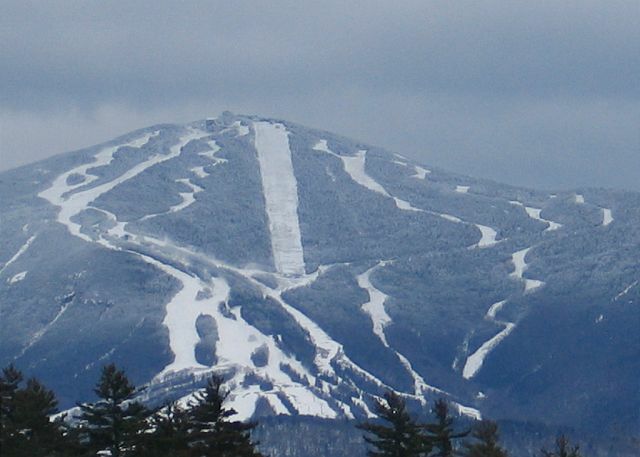 Cannon Mountain is less than 15 miles from the house, with Bretton Woods even closer at under 7 miles, and the grand Mount Washington Hotel and The Cog Railroad are both under a 20 minute drive. 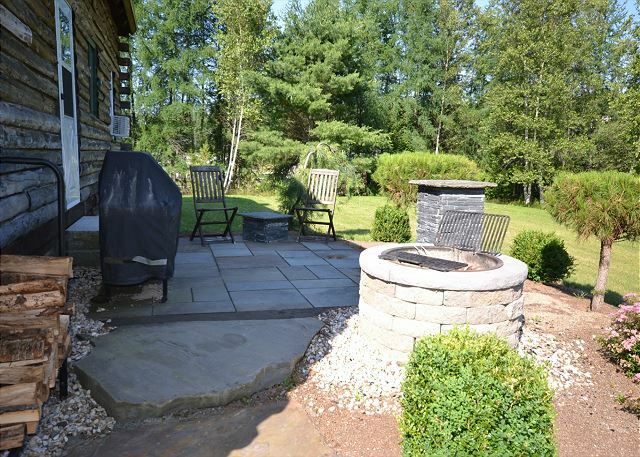 The back yard of the home features a patio and fire pit, complete with grill top. The "back 40" of the Twin View Log Home offers guests plenty of room to play, as seen here, and there's great fishing right across the street too. 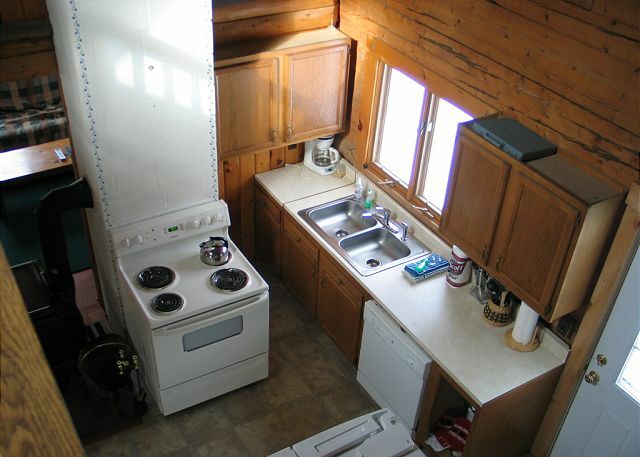 The living area of the Twin View Log Home is very well furnished for your comfort, complete with satellite cable. Long view of the living area, with the kitchen seen to the right. The dining area, located adjacent to the living area, with seating for 6. The kitchen. High ceilings make the small size seem much larger, and the centrally located wood stove is perfectly placed to warm the entire home. View of the kitchen from the top of the stairs to the second floor. The main floor bedroom features a pyramid style bunk bed, with a queen on the bottom and a twin on the top. The room also has its own TV and ample closet space. Main floor bedroom, located just off of the kitchen. Bedroom #2 with double bed, top floor. Bedroom #3 with double bed, top floor. 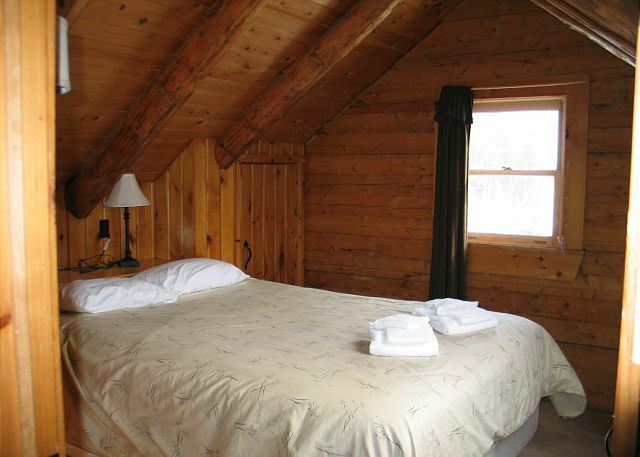 Twin Mountain, NH has long been regarded as "the heart of NH's White Mountains" as it is surrounded by 4000+ foot peaks including the famed Mount Washington--and the Twin View Log Home sits in the midst of it all. Great fishing lies in wait just across the way, and up the road is the grand Mount Washington Hotel and Crawford Notch State Park, with Franconia Notch State Park within a 20 minute drive. This professionally managed vacation home is nicely decorated and modestly, yet well done, to ensure guest comfort. The warming soap stone wood stove is a nice accessory, and is sure to chase any cold day's chill away. The three bedrooms offer one queen and two full size beds, providing comfortable sleeping for up to six. The main floor features one bedroom, the bathroom, plus a nice living/dining area which is separate, yet very close to, the kitchen. Upstairs, and separated by a cat-walk, are the 2nd and 3rd bedrooms. Family games and a large TV with X-Box Game Station and DVD player will be at the ready in the living for rainy day fun. Spent absolutely magical winter vacation at Twin View. Snowshoed near cabin and at many nearby trails in Whites. Cabin is perfect. Everything provided. Set off by itself. Near road,but super quiet. Shopping 3mi. away in Littleton. Lovely town. 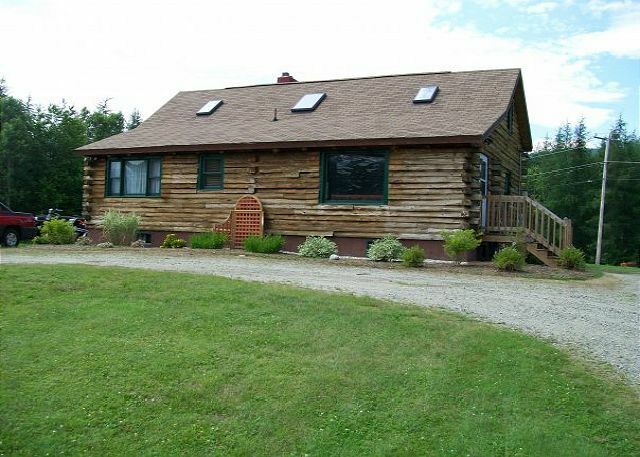 Would recommend this home and Franconia Notch Vacations who assisted us all along the way. This was our 2nd stay at the Twin View Log Cabin. The place works great for our family of 4. Only 10 mins to Bretton Woods. We had an excellent time here - the cabin was very clean and in a good location. The kitchen was well stocked with pans but did not have any oil, spices, foil, etc that we find at our other vacation homes. This is not a negative, just don’t forget to bring them! The cabin is on a main road, so you can constantly hear cars going by as well. Overall a very good experience. Our family had a wonderful time at this house. My husband was really impressed by the true " log cabin" type of house. We had plenty of room. The kids loved it. It was in a great location for what we were looking for. We loved how close it was to brettonwoods! It fit our family of five perfectly ( it's even big enough for them to each bring a friend.......someday)! We loved the heated spacious mud room to store and lay out our ski gear. The home is so close that on the days I did not ski I dropped my husband and kids off at the mountain, returned back to the cabin for some R&R and packed up food and met them for lunch! The house was spotless and Court from Twin Mountain Management was more than accommodating. We are lucky enough to book it again in a few weeks! 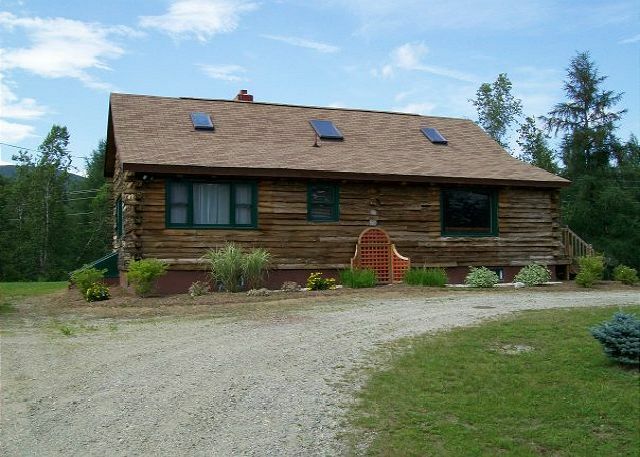 Another great rental in the White Mtns! We had a fantastic 4 night stay here! 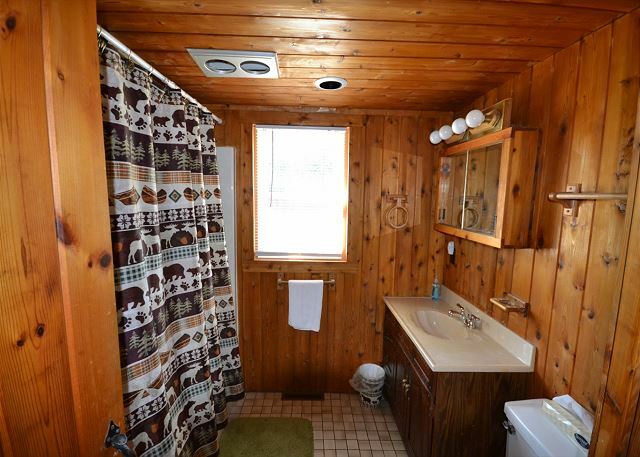 The log home was clean, simply elegant, and had everything as advertised. It was larger than expected and well suited for our group of 4 adults and 2 children. Ours kids thoroughly enjoyed the back field for playing and roaming around in. We all enjoyed sitting around the fire pit, looking up at the stars, and watching the fireflies. My wife was pleased with how clean everything was. We were thankful for a ready to setup pack-and-play provided by Cort and for his overall customer service. He also quickly resolved a wifi issue we had on our arrival. We would definitely recommend it as a place to stay and would be happy to return on a future journey if we had the right number of people to stay (6 is really the max). The kitchen was suited for 2 cooks at a time at most. Our three main attractions were the Cannon Mountain Aerial Tramway, Mount Washington Auto Road, and the Flume Gorge. All were reasonable driving distances away. We only wished we had more days to stay to continue exploring. The home is located on a well traveled road, but we didn't find it affected our ability to rest and relax. Views of the mountains are limited due to trees, but it still felt like we were part of it all. I am writing this 2 weeks after our departure and my 3, almost 4, year old son asks us almost everyday why we had to leave "the cabin." When I retire, I hope I can live in a home like this. It was perfect for us! Jeffrey H from Pelham, NH does not recommend this vacation rental. Wow... we too are certainly regretful that this guests choice in homes was not to their liking. In reviewing records Mr. H chose this property without any assistance or questioning of us regarding, and and that this 'pet friendly' booking was made within 48 hours of arrival on a nearly sold out Holiday Weekend. Again, it is regretful the cabin did not suit the desires and exceptions of this guest, however we believe the review to be a tad harsh toward the property & management while perhaps being more reflective of the guests un-assisted choice. Please always feel free to contact us with any questions or concerns that you may have in regards to your choice of vacation home so in order that we answer them before your arrival for your assured comfort and not after departure with mutual displeasure as seen here. Mr. Houlihan, please call us next time so we can better assist you, and perhaps with more than 48 hrs notice, so the choice of pet friendly homes to choose from might better suit your liking. Sincerely, Cort Roussel, Owner-Manager, Franconia Notch Vacations. Everyone from the property rentals was so nice to work with. They were friendly and very helpful. The log home was like having a home away from home. A wonderful place to stay. We stayed here with our 3 children for a week. The location was close enough to every activity we had planned. It was nice to not have to spend an excessive amount of time in the car. 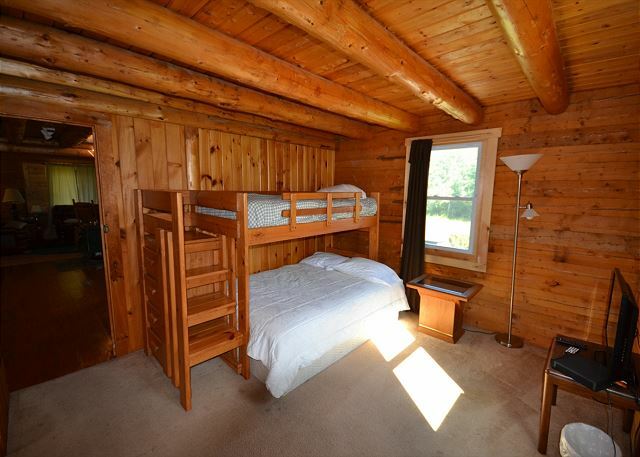 The cabin was spacious, clean and had a large yard perfect for the kids to run around and play. We hope to stay there again in the future. Management at Franconia Notch Vacations were friendly and helpful. Thank you for a great experience! You are most welcome Jana, and so glad to hear you enjoyed your time here so much. It was beautiful, perfect time of year to travel and see the trees change. Relaxing, I needed a break from reality and it was perfect for me, my daughter, her boyfriend and our 2 dogs. They enjoyed it as well. The only thing that was disappointing to us was being on a main road, it was loud with all the cars and trucks, but other than that everything was Amazing. Def a place I would recommend for family and friends and would love to come again!! Thank You Very Much!!! Chelsea Stiles, Daughter of Deborah Stiles. First, thank you to Cort and the owners for letting us avoid the rains of Hurricane Irene and move our rental back one day. The house had some very nice features especially the back patio with firepit. We enjoyed our evenings out back. The DVD player was nice too. The house was situated central to everything we wanted to go to: Santa's Village, Cog Railway, Franconia Notch attractions, and Story Land (a bit far from the latter, but ok). One downside to the property is the proximity to a major road. The skylights in the two upstairs bedrooms face the road, and when they are open the noise is very loud. On warm summer evenings, we had to have these open or it's too hot to sleep. When the skylights are closed the noise is no problem. So I'd be more likely to recommend this as a ski rental. Also, there are several screens and windows that are broken/missing and need to be replaced. Finally more lighting is needed over the sink and stove. Thank you for your open and honest review Ms. Diaz, and of course thank you for the outstanding manager rating. To offer feedback regarding this home, the owner is in process of making updates and upgrades to include new windows coming in this fall, 2011, which will make all the difference come summer 2012. Good working windows & screen will all be in place by then, as will be air conditioners to thwart both the hot nights and road noise accordingly. Also, rest assured the owner will be updating the lighting in the kitchen. Thanks again for coming our way Deborha. Sincerely, Cort Roussel, Owner-Broker at Franconia Notch Vacations. We stayed for 3 nights and 4 days at the Twin View Log Cabins. It is much more adorable and spacious than displayed on the website. With 4-6" of new snow each day we did not experience the twin views, but it was absolutely great for the skiing we did everyday at Bretton Woods(which was 5-7 min down the street). 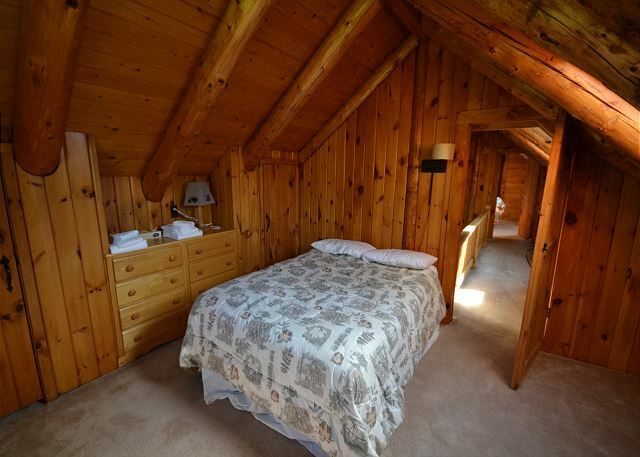 The cabin had all the comforts of home with exceptionally "dreamy" beds. The only things I would recommend is a "dreamy" bed over the living room, more lighting in the kitchen area, a new shower head. To note: we were not ploughed out during our stay . 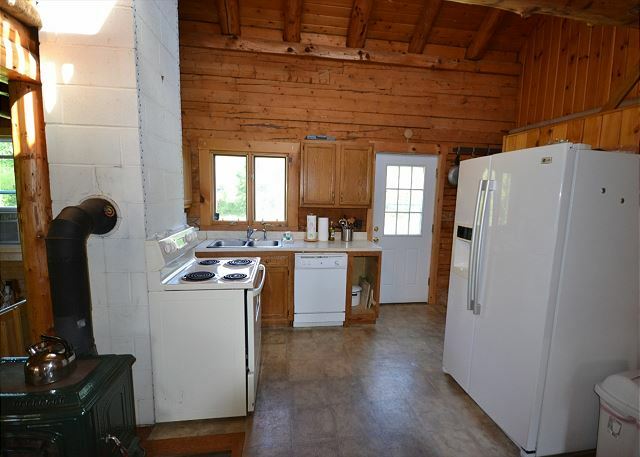 They need better pictures of the cabin i.e, suprised by the great mud entrance way for the skiers to leave their gear. We had a group of friends up in NH for New Years. We spent a day skiing and a day relaxing in the cabin playing games. It was easy and fun! Property was charming- great location for both Cannon and Bretton Woods. Only recommnedations would be to get more lights- Over stove and sink in kitchen, a couple more in 'living room' so people can read and the same in the bedrooms especially- the one light in the downstairs bedroom made reading in bed impossible and it was very difficult to find stuff when the sun went down. Thank you for your recent input on how we can improve the enjoyment to be had at our Twin Mountain vacation home. Adding and improving to our lighting accents will be a future focus, so again, thank you for helping us improve the experience for all of our guests. Sincerely, Cort Roussel. Manager-Broker-Owner, Franconia Notch Vacations Rental & Realty, LLC.